The Agnews Washington Cash Iron insert is a modern and contemporary interpretation of the traditional cast iron insert with strong straight highlighted lines contrasting with dark cast iron background to give a very modernist feel. The Agnews Fireplace would look great with either a traditional or more contemporary setting with the dark cast iron and bright highlighted lines either contrasting or harmonising with the surrounding decor. Available in either LED electric or natural gas with an input of 6.9Kw the Washington fireplace would be perfect for almost any home with a range of surrounds to help the insert match the style of the room. To achieve a very modern and minimalist look, combine the Washington Cast Iron Insert With The Flat Victorian Limestone Surround and Black Granite Hearth. The darkness of the cast iron and hearth contrast with the light limestone accentuating the bold highlighted lines and drawing the eye towards the flame effect while the straight lines of the surround blend with the strong polished lines to complete the minimalist feel. 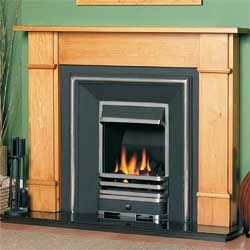 Conversely a very traditional yet contemporary feel can be acheived by simply using the Agnews Flat Pine Surround and granite hearth which uses the rich colour of the wood to further bring out the highlighted lines and draw your eye towards the fire.